This book will be launched at Vic Books in Kelburn at 5.30pm on Monday 22 September. ‘The world is full of murder and words are usually the first to go’. Sometimes, though, words are all we have. 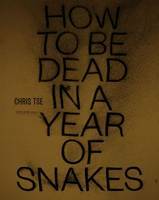 In his new poetry collection, How to be dead in a year of snakes, Chris Tse pieces together narratives of the dead and the guilty, in what could be described as an epic riddle. Groping for clues, the reader consults killer and victim in turns – ‘they’ll want a finger/ with which to point/ at suspects and victim’. But this is no binary case of hero and villain. Lionel Terry who, in 1905 ‘went hunting for a Chinaman’ is as human as his victim, and we find ourselves romping about in both parties’ shoes. Where their paths intersect in violence, there commences, perversely, a co-dependence, an ‘intimate relationship’ between men. As Tse points out, ‘To kill a man/ is to marry a shadow’. And Lionel Terry brings with him the ghost of Joe Kum Yung. More than a marriage of souls, though, Tse’s work is a convergence of cultures. Cantonese and European and Maori cultures form a tripartite, tethered to the Wellington street upon which the men cross paths. This is poetry as history − both worldly history and history of the individual. When Tse writes ‘As you bleed out/ the night rejects your history’, one imagines not only the life of Joe Kum Yung is lost, but, with it, the stories of Cantonese settlers in New Zealand − ‘a gallery of lost names’. Sometimes words are all we have. In recounting tragedy, Tse brings to life the ‘ghosts chattering’. The essence of Joe Kum Yung is conjured, and history is etched out in his own words. But we are cautioned that ‘the storyteller’s tongue (is) laced with favour and prejudice’. Narration comes with the power to alter history, and Tse lends Joe Kum Yung the power to ‘rewrite his truths’. But everyone has a moment on the soapbox. Even the fantails ‘fill the clouds with their opinions’. How to be dead in a year of snakes is a brave traversing of fiction and New Zealand history. Tse shows how alienation and xenophobia can conspire in human tragedy. This is a riddle but also a lesson, one where we ‘must reach back into madness’ to learn from events that preceded us. Perhaps, like Terry, we are to be ‘forever measured by the shadows (we) leave’. Here is a video of Chris Tse. This entry was posted in Book review, Poetry and tagged auckland university press, Chinese in Wellington, Chris Tse, elizabeth morton, How to be dead in a year of snakes, SS Ventnor by booksellersnz. Bookmark the permalink. Reblogged this on National Poetry Day NZ.